quickcrit - music reviews: East End Block Party! 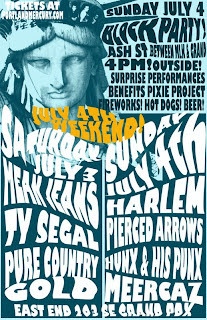 After checking out the line up, I am amped for the East End's Block Party this July 4th weekend. Saturday nights features some of my favorites from Slabtown's Bender. Ty Segall just released Melted and Pure Country Gold should be releasing Tough Tuesday any day now, so their should be plenty of new songs to hear and love. With manic and entertaining Mean Jeans headlining it will ensure a great night of loud, sloppy rock n' roll. And Sunday features the catchy garage pop of Harlem. I still can't get enough of Hippies. Of course, it will mean missing out on some of the Waterfront Blues Festival, but lucky for me, Cedric Burnside & Lightnin' Malcolm are playing on Friday and Booker T is playing pretty early on Saturday. 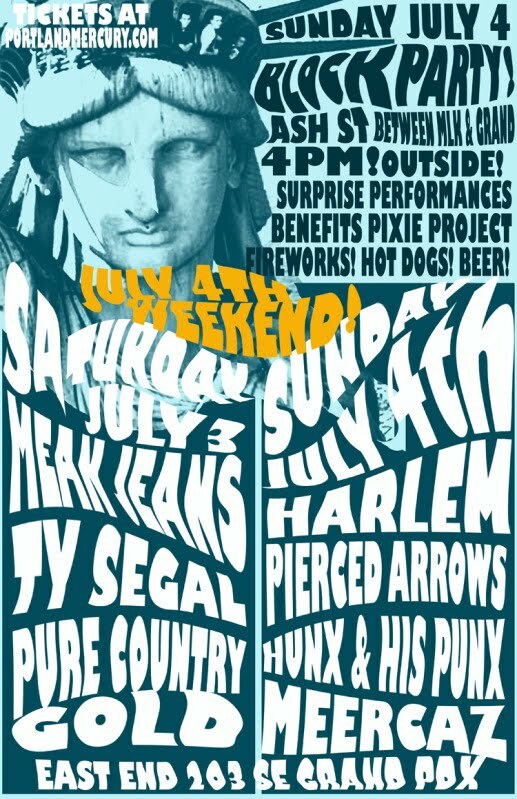 I'm also intrigued by Hunx and his Punx. They sound like dudes fronting a glammy girl group band. "Amazing, at once hilarious and deeply good pop songs, like the Gay Ramones mixed with Ronnettes filmed by John Waters." How rad does that sound? If by "amazing" they mean "awful." Want to recreate the sound in your shower? Hold your nose and yell the lyrics to your favorite girl group song.